At his yearly checkup a few weeks ago the Dr. suggested that I go to "Shangrila" and buy an ear wax extraction device due to the fact that Nick had large amounts of hard black wax lodged down in there. OUCH! No wonder the boy gives us all the duh stare when you talk to him sometimes. He can't hear. Not to mention it is totally painful if you even touch it or he bumps it. So, we found the "ear candle". Is it the most bizarre thing you've ever seen? The smoke supposedly goes down through the tube and into his ear, forcing the wax back up and out into the tube. And it WORKS!!! Oh man.... seriously, we put Shrek to shame. Oh, and Nick is a new man. Only the kids woke him up at 6:30 am... he was sleeping right through the morning noise before. 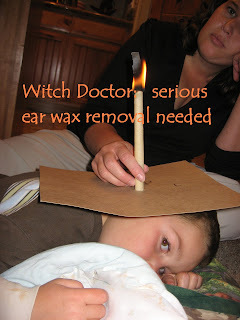 If you have an ear wax problem... Jenny the Witch Doctor highly recommends the ear candle. I just have to say, that is one of the oddest things that I have seen but you know what, if it works...I feel terrible that he's been having hearing problems. He'll probably be a new kid now that he has that solved. Way to go Dr. Jen! I've heard of those but never knew they really worked! ok, that is seriously the strangest thing I've ever heard of! shut.up. that's the craziest thing i've ever heard! but if it works - SHOOT ... i'd do it! Christian use to have an ear wax problem. He regularly flunked his hearing tests PreK-2. The nurse knew what the problem was so she just ignored the flunking. I would continue to watch Nick for wax build up in the future.